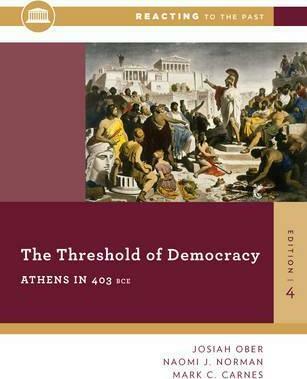 The Threshold Of Democracy : Athens in 403 B.C. In this Reacting to the Past game, the classroom is transformed into Athens in 403 B.C. In the wake of Athenian military defeat and rebellion, advocates of democracy have re-opened the Assembly, but stability remains elusive. As members of the Assembly, players must contend with divisive issues like citizenship, elections, re-militarisation and dissent. Foremost among the troublemakers: Socrates. Reacting to the Past is an award-winning series of immersive role-playing games that actively engage students in their own learning. Students assume the roles of historical characters and practise critical thinking, primary source analysis, and argument, both written and spoken. Josiah Ober is Constantine Mitsotakis Professor in the School of Humanities and Sciences at Stanford University, where he holds joint appointments in the departments of political science and classics. He is the author of several books on classical Athenian political and intellectual history, most recently Political Dissent in Democratic Athens. He is now working on a project about the relationship between democratic political culture and the social circulation of knowledge. Naomi J. Norman is a Josiah Meigs Distinguished Teaching Professor of Classics at the University of Georgia, where she teaches courses in Greek, classical culture and classical archaeology, and serves as Director of the UGA Reacting to the Past program. Her current projects include a book on the archaeology of ancient Carthage, a textbook on classical archaeology and, with Carl Anderson and T. Keith Dix, a Reacting game on the Ides of March, Rome in 44 B.C.E. Mark C. Carnes is professor of history at Barnard College and creator of Reacting to the Past. He is the author of many books in American history and general editor of the 26-volume American National Biography, published by the ACLS and Oxford University Press.